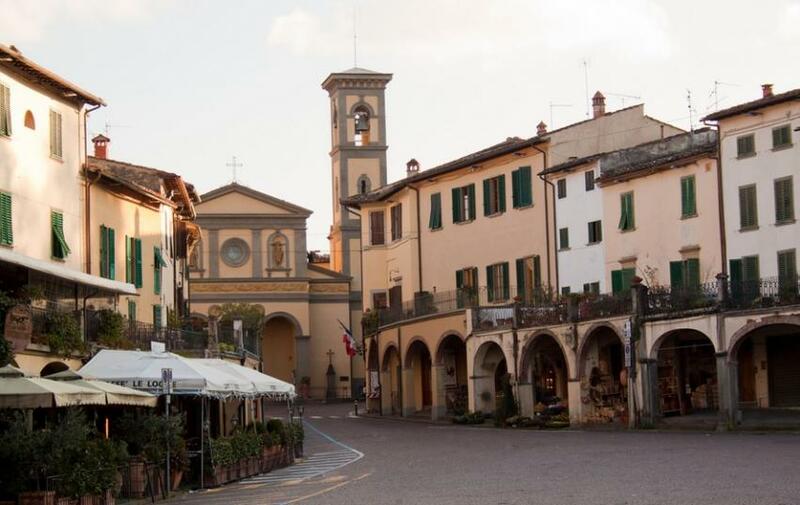 Greve, the little Chianti capital, lies on the SS222 Chiantigiana route south of Florence. The biggest wine fair in Chianti occurs every September in this medieval townlet (pop. 10,800). Located on the banks of the river Greve, it is celebrated for its charming, arcaded, funnel-shaped Piazza del Matteotti, studded with a statue of Giovanni from Verrazzano, who was the first European to sail into New York Bay (and gave his name to the Verrazzano Narrows Bridge). It has a Museo del Vino that might or might not be open. And that’s about all – its castle was burned in 1387, and its Franciscan convent converted to a prison in the last century. However, in the parish church of Santa Croce there’s a triptych by Lorenzo di Bicci and a painting by the ‘Master of Greve’. But Greve is awash with wine, so it is worth seeking out the specialized wine shops. The ancient village and castle of Montefioralle, on a commanding height 1km west of Greve, is where the people of Greve lived in the bad old days. Recently restored, it is an interesting place to poke around in, with its intact octagonal walls, its old tower houses, and two Romanesque churches: Santo Stefano, housing early Florentine paintings, and the porticoed Pieve di San Cresci a Montefioralle, just outside the walls. The road to Montefioralle continues on passing the ruined castle of Montefili, built in the 900s as the eastern outpost of one of Chianti’s most powerful religious institutions, the Badia a Passignano. Surrounded by an impressive wall of cypresses, this fortified complex began life as a Dark Age Lombard castle. About 890 it became a Benedictine monastery. Most of the buildings you see today are from the mid 15th century, after the monastery had passed to the wealthy Vallombrosan Order. Elegant enough for the noble monks, they still bear a hint of the place's military origins. That became even more pronounced after the Badia was closed in 1866 and sold off as a private villa; the owners added the medieval-style crenellations and other features. The monastery was dedicated to St Michael, and the mystically inclined will note it lies very close to the European 'St Michael Line' that seems to connect sites dedicated to the Archangel from Skellig Michael in Ireland through Mont-St-Michel and many Italian churches, to Delphi and Mount Carmel. Unfortunately, much of the Badia is under restoration, though some parts of it will be open by reservation on Sunday mornings. If you do get in, you can visit the old abbey church, San Michele, which contains works by Domenico Ghirlandaio (a fresco of the Last Supper, painted with his brother Davide); Alessandro Allori and Domenico Cresti (better known as 'Passignano') and a bust of San Giovanni Gualberto, founder of the Vallombrosans, who arrived here in the mid-11th century. The church of San Biagio has a colourful fresco cycle by a talented local quattrocento painter, Filippo di Antonio Filippelli. Outside, there's a pretty topiary garden. Just east of Greve, the beautiful villa of Vignamaggio was built by the Gherardini family, whose most famous member, Lisa, was born here. She married Francesco del Giocondo before posing for the world’s most famous portrait. In 1992 it was the setting for Kenneth Branagh’s film, Much Ado About Nothing; today it's a hotel and winery. 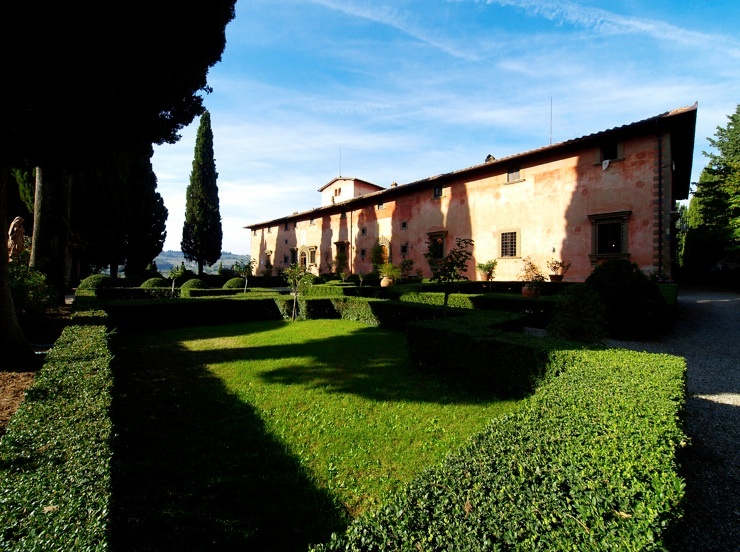 A mile north of Greve stands the Castello di Uzzano, built by the Bishop of Florence in the 13th century and then gradually converted into one of Chianti’s most impressive villa estates. Museo del Vino, Piazza Nino Tirinnanzi 10, Greve, website, +39 055 854 6275. Closed for renovations at the time of writing.